When it comes to public buildings, a fire escape plan is a necessity. In fact, in the event of a fire emergency, having the proper fire safety measures in place can make all the difference. When it comes to public buildings, a fire escape plan is a necessity. In fact, in the event of a fire emergency, having the proper fire safety measures in place can make all the difference. When was the last time you even had a fire drill in your office building? Implementing a proper fire evacuation plan can be an excellent way to jumpstart your fire safety plan overall. Here are some considerations when planning a fire evacuation plan to ensure that everyone gets out safely in the event a fire breaks out in your building. More than just a super basic floorplan, having a proper fire safety and evacuation plan in place makes a significant difference in a fire emergency. Having a professional help create a solid plan that includes detailed building maps along with clearly marked evacuation routes, meeting points, and the location of various fire-related infrastructure can be the crucial elements to have in your building in the event of a fire emergency. These professionals understand the importance of considering all variables when building these fire plans. As a result, you get the most effective strategy to ensure that your building and the occupants of it stay safe if a fire ever breaks out. What’s Involved In A Fire Escape Route Plan? A simple fire escape route plan will include a floor plan that has apartments or workstations marked with exit routes (both primary and secondary) which are easily visible. Having these exits marked becomes very important. Secondary paths are incredibly crucial if a primary evacuation exit is for any reason obstructed as a result of smoke or fire. Public spaces need to be kept safe for everyone who visits them. 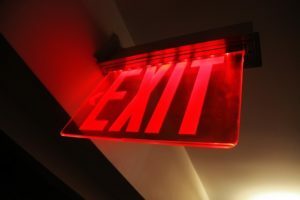 Public spaces like restrooms, amenity rooms, lunchrooms, and conference rooms will have exit signs to help ensure that everyone can easily locate the emergency exits in the event a fire breaks out. KEEP YOUR BUSINESS AND HOME SAFE WITH ANDERSON FIRE PROTECTION, INC. This entry was posted on Thursday, April 11th, 2019 at 10:20 am. Both comments and pings are currently closed.